Welcome to Tatum & Cox! Our team is proud to offer a comprehensive dental office that is your one-stop-shop or oral care. 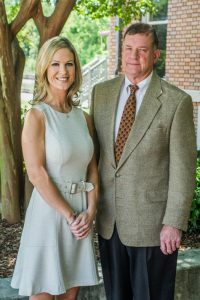 Our dentists, Crawford A. Tatum Jr., DMD & Christina Cox, DMD, have many dental talents, and they are thrilled to offer full care without the need to refer you out to other dental offices. If you need it, we can do it! We are proud to accept Blue Cross Blue Shield and Southland providers. Call our office today for new patient special offers! Our team is an educated, professional, and experienced group of people, and we are proud to be associated with many dental organizations. We are here to give you the best dental experience possible, and we are happy to do so by having education and experience in the needed areas of the dental field. Tatum & Cox has been in the area for 96 years, and we plan to serve you and your family members for many more. We are a family-friendly practice that has been passed down throughout the Tatum family, and we are so excited to have you join our big, happy dental family! We work hard to serve Opelika, Alabama, and the surrounding areas of Auburn and Valley, Alabama, and Columbus, LaGrange, and West Point, Georgia. We are also happy to provide a high-tech and enhanced dental experience with the use of CT machines, periodontal laser machines, E4D technology, an in-office lab, and digital x-rays. To get to know us a little bit better, we invite you to browse our website and give us a call. We look forward to turning your dream smile into a reality!